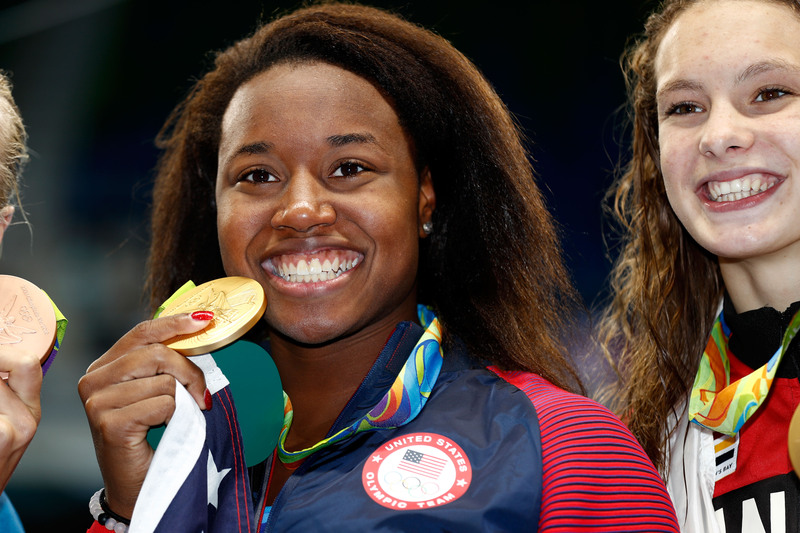 Simone Manuel became the first African-American woman to win a gold medal in an individual swimming event at the Olympics. She made history during the 100-meter freestyle event in Rio, and yet, as Colorlines reports, NBC didn't air Manuel's medal ceremony live. BBC aired it, while NBC instead showed a taped recording of the Russian gymnastics team from earlier in the day. “We always like to end our primetime coverage with the National Anthem, and last night we chose Simone Manuel for her historic performance. We also remained on the air to show the Canadian National Anthem because there was a tie for the gold medal," an NBC spokesperson explains to Bustle via email. "Since NBC didn't air it" began trending on Twitter when Deadspin shared BBC's footage of the medal ceremony. The BBC video showed what NBC had been airing at the time, for the sake of comparison. NBC explained in its statement that the network prefers to end their primetime coverage by showing the national anthem, which would explain why it chooses show certain pre-taped events and not others. Moreover, for many black Americans, Manuel represents hope after an era of segregation during which public pools were discriminatory markers of division. According to the CDC, black children between the ages of 5 and 19 are 5.5 times more likely to die from drowning than white children, and a 2010 study revealed that 68.9 percent of African-American children had “low or no swim ability." You can watch the BBC/NBC comparison video over on Deadspin's website.